Summertime always seems to be so rife with tempting treats, and in our family, one of the ways we stay on track is by occasionally making our own lower-sugar, grain-free, dairy-free version of whatever goody we feel like we’re missing out on. 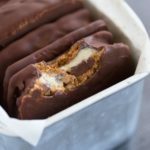 That’s how these Chocolate Chip Cookie Ice Cream Sandwiches came about, from talking with my girls about what we could make at home that might be similar to the treats given out at swim meets. The cookie characteristics that are desirable for making an ice cream sandwich are a little different than normal cookies. They need to be a bit cakey and absorbent, soft right out of the freezer, but still solid enough to be able to assemble the ice cream sandwiches in the first place. 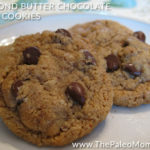 This is achieved with a slightly different fat to sugar ratio than normal cookies along with a lower oven temperature for baking. 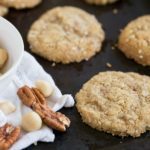 If you cook these cookies a bit longer (about another 5 minutes), they become crunchy and a pleasant nut-free normal cookie if making an ice cream sandwich is too fussy for you. 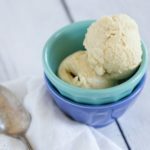 There are so many options for dairy-free ice cream now compared to when I first started this website. I can now easily get coconut milk, almond milk and cashew milk ice cream all with a few more emulsifiers than I would ideally like although something I don’t worry about for an occasional treat. If you want to keep this super clean though, go ahead and make your own ice cream! I think they taste better 100% homemade anyway! So, whether its a summer barbecue, a birthday party, or just one of those days where a good treat can make all the difference, enjoy! Beat together coconut oil, sugar, egg and vanilla until creamy. Mix together cassava flour, baking soda and salt. Add to sugar mixture and stir to combine. Roll out 12 even-sized balls of dough (they’ll be about 1 1/2″ in diameter). Place dough balls well-spaced apart on a cookie sheet and then use the palm of your hand or the bottom of a glass to flatten the balls into 1/4″ thick circles (basically the thickness of the chocolate chips). 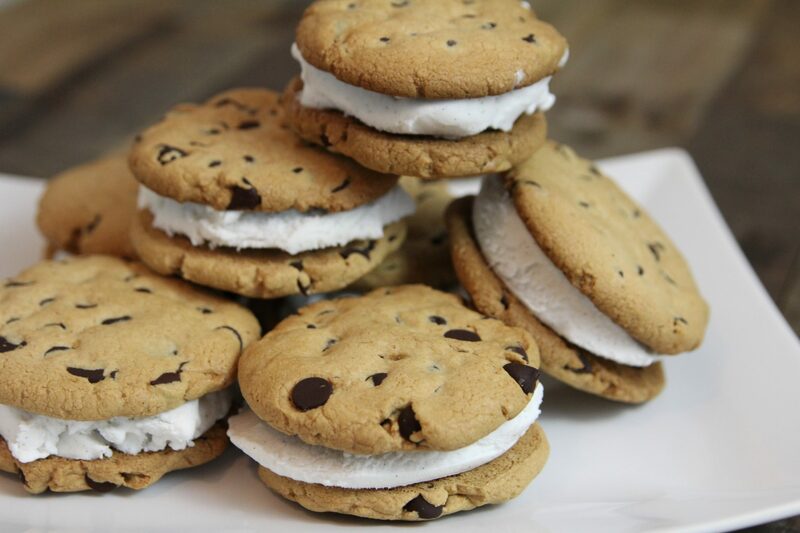 Remove the cookies and your ice cream from the freezer to assemble the ice cream sandwiches. 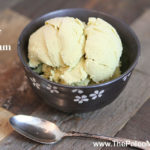 (This works best if the ice cream is a bit soft, i.e., if you have a soft zone in your freezer or if you just pulled homemade ice cream out of an ice cream maker. If you’re using store-bought and don’t have a soft zone, place the ice cream in your fridge for an hour before you assemble the sandwiches.) Spread ice cream about 1/2″ thick over the underside of one cookie. Place the other cookie on top (again with the underside touching the ice cream). Repeat with remaining cookies. 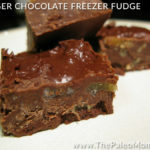 Place the cookie sheet back in your freezer for at least 1 hour before serving. For storage, move ice cream sandwiches to a freezer-safe container or bag. 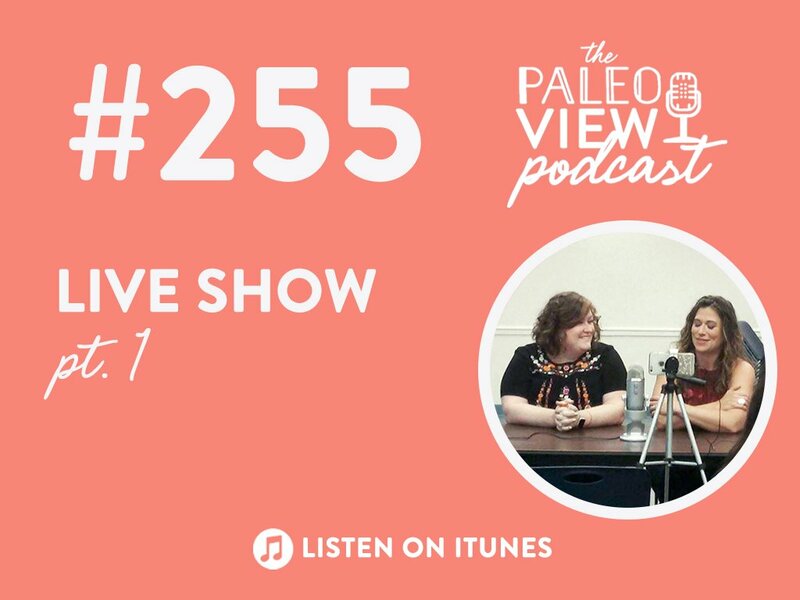 I am having difficulties following the Autoimmune Paleo diet, because there seems to be conflicting information as to what I am allowed to eat. For instance, to beging with it says, “no eggs, no nuts, etc. then on the recipes those items are in the list of ingredients. The same with Almond milk! I am desperate trying to deal with my condition but I thought that the Paelo Autoimmune diet was going to be more straight forward. Can you help me? I have “Funtional Dyspepsia”.